The critical concern of the workshop “Utopia Computer” is the euphoria, expectation and hope inspired by the introduction of computers within architecture in the early digital age. With the advent of the personal computer and the launch of the Internet in the 1990s, utopian ideals found in architectural discourse from the 1960s were revisited and adjusted to the specific characteristics of digital media. Buckminster Fuller’s World Game, Gordon Pask’s belief in an architecture that can learn via feedback loops, and Frei Otto’s form-finding experiments bore witness to concepts of participatory planning procedures, self-optimising design processes and non-standard architectural structures. These ideas gathered momentum in the 1990s: Planning and negotiating architecture was reconceived as gameplay, initiating the exploration of virtual game interfaces as potential sites for generating collective and interactive urban solutions. Algorithm-based computer software and parametric design fostered the idea of a self-organising architecture that emerges from the interplay of parameters able to offer “optimised” answers to internal and external constraints. And the 1990s buzzword liquid architecture captured the concept of an architecture capable of adapting flexibly to changing parameters. At the same time, technological developments at the turn of the millennium were part of neoliberal shifts in politics and the economy. Scenarios of all-encompassing surveillance and the commercial use of private data, as well as social injustices resulting from free-market economic practices thus provoke the question, have dystopian narratives replaced utopian ones? Taking the 1990s discourse as a starting point, the workshop will centre critical and historical reflections on the significance of ideas about interconnectedness in the post-war period and its participatory effects, about self- organisation and its potential for optimisation, and about non-standard architecture and its capacity to adapt itself to its environment, asking, in what ways have these utopian ideas changed in today’s digital culture? This section will explore the utopian potential of the relationship between gameplay and urban planning. Ubiquitous computing has turned today’s cities into computationally- controlled environments, with logistics and infrastructural networks at their centre. Navigating the possibilities of game environments, architects experimented with visualisation techniques in the 1990s that were based on data collection, interactivity and networks, allowing users to act out urban scenarios. We would like to shed light on how cybernetic approaches – and their systems-oriented view of the world – are interlinked with discourses about multimedia technology. How do gameplay and planning interact, and what are the rules and infrastructures of computer technologies, in particular with regard to the ubiquity of computational techniques and questions of data control? This topic aims to critically examine the utopian moment of self-organising architecture, formed without a prior plan and without the subjectivity of a designer. Considering the interplay of different constraints made possible by the help of computational processes, the “best design” is often one borne not only out of the material itself but also from economic forces. We are interested in how cybernetic theories about self-adapting architectural systems, biological inquiries of living beings (autopoiesis) and their transfer into systems theory, and parametric design are connected. What hopes and risks are attached to ideas of self-organisation? How does the political and economic ideology of a free and self-regulating market interact with the idea of self-organising architecture? This section focuses on the production of singular and non-standard architectural forms that are liquid – they respond to human interaction and local constraints by changing their configuration. Imagining the advent of an unprecedented, utopian built environment composed of unique and flexible adapting surfaces, designers moved analogue form- finding experiments into the digital realm. Thanks to software, architecture could be modelled freely but it was still bound to cyberspace. The workshop asks how explorations of form-finding changed with the development of computer technology. How do form-finding techniques approach standardisation by applying interactive ecological perspectives in building practice? What impact do liquid architectures have on the global trend towards iconic buildings? We welcome contributions from an architectural perspective as well as from other disciplines. Please submit your proposal of max. 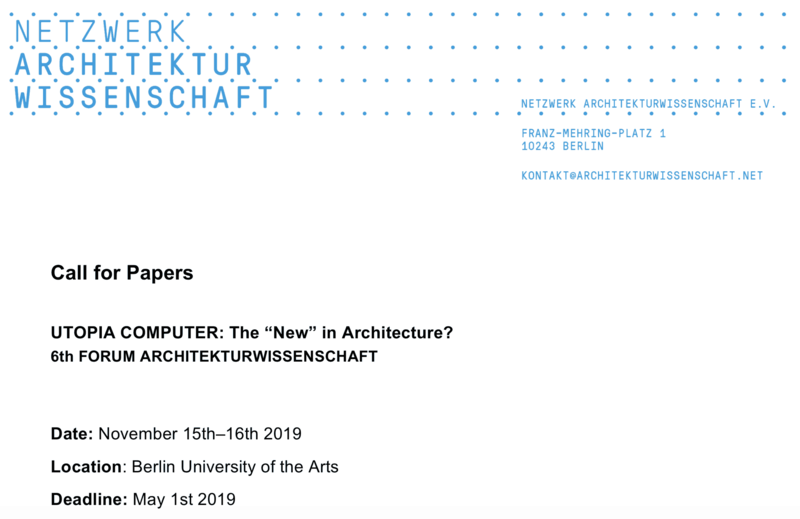 400 words along with a brief CV by May 1st 2019 to forum2019@architekturwissenschaft.net. Authors of accepted proposals will be notified in June. Depending on funding, travel costs will be reimbursed. The lectures should not exceed twenty-five minutes. The conference will be held in English. The contributions will be published (open access and print on-demand) in the series of the Forum Architekturwissenschaft. The Forum Architekturwissenschaft is an event of the Netzwerk Architekturwissenschaft e.V. (www.architekturwissenschaft.net), a platform for interdisciplinary academic exchange, and a network for architectural studies, engaging diverse research practices and methods as part of an ongoing discourse.